Just wondering if anyone knows a thing or two about cyclonic systems to help me out or provide resources to do so. There are at least 2 cyclones off the coast and I'm wondering if we should prep for them or not. The first one we are getting wind and rain but it's still about 200-300km out and predicted to go back out to sea. Link to see what I'm on about. Going off the given information on those sites I would take a guess that the worst that might happen is some power outages and maybe some minor flooding and wind damage. The only one that looks like it might be a problem is Nathan but that one is expected to move away from the land. Until it says Category 3 or 4 or you are in the direct path of the storm you really don't need to worry so much about it. Intensity: category 2, sustained winds near the centre of 95 kilometres per hour with wind gusts to 130 kilometres per hour. Location: within 65 kilometres of 13.9 degrees South, 145.9 degrees East , 100 kilometres north northeast of Lizard Island and 190 kilometres north northeast of Cooktown . Movement: west southwest at 13 kilometres per hour . GALES extend out to approximately 180 kilometres from the centre and could develop about coastal and island areas between Coen and Port Douglas overnight and should persist into Thursday. GALES could extend north to Lockhart River later on Thursday, depending on the track the cyclone takes. VERY DESTRUCTIVE WINDS are expected to develop within 45 kilometres of the centre during Thursday morning and could begin to affect coastal and island areas between Cape Flattery and Cape Melville from late Thursday morning. DESTRUCTIVE WINDS extend out to 70 kilometres from the centre and could develop about the coast and islands between Cooktown and Cape Melville, including Lizard Island from early Thursday. Areas of heavy rain, which may lead to flash flooding, are expected across parts of the North Tropical Coast and Tablelands and Peninsula districts this evening and should persist into Thursday. A separate Severe Weather Warning for heavy rainfall and damaging winds is now also current for parts of these districts. Abnormally high tides could develop about coastal areas between Coen and Cape Tribulation during Thursday with large waves possibly leading to minor flooding along the foreshore if the cyclone takes a more westward track closer to the coast. People living in areas that could be affected by this flooding should take measures to protect their property as much as possible and be prepared to help their neighbours in case this scenario occurs..
People between Coen and Port Douglas should immediately commence or continue preparations, especially securing boats and property. - For emergency assistance call the Queensland Fire and Emergency Service (QFES) on 132 500 (for assistance with storm damage, rising flood water, fallen trees on buildings or roof damage). People between Lockhart River and Coen should consider what action they will need to take if the cyclone threat increases. direct path of the storm you really don't need to worry so much about it. That was my thoughts, However my worry is "Pam" out east. From what people are saying it's almost like Yasi(A cat 5 that started east of fiji). Just wondering if there's anything anyone could tell me about that. Sorry for being vague and what not but I have no resources for "Pam". Considering the position and movement of Pam and people far more versed in weather than I are having difficulties predicting it's path, all I can recommend doing is keeping an eye on it and checking weather reports for the next couple days. 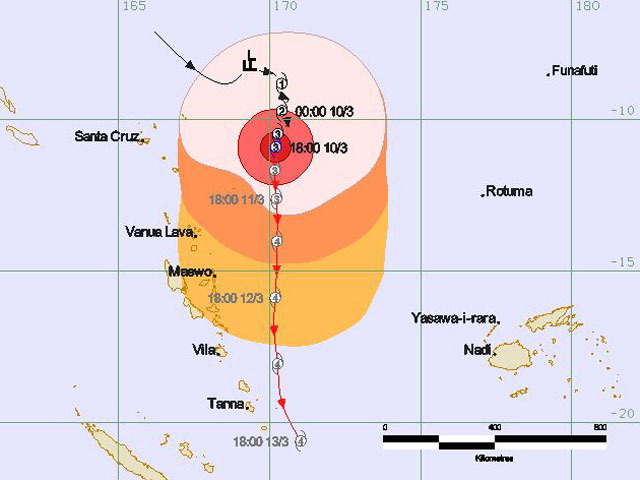 On the current forecast track, the center of Pam would remain away from many of the islands in the area – but will get dangerously close to portions of the Vanuatu Islands and potentially New Caledonia. Regardless, the threats associated with a tropical cyclone extend well beyond the center and you should never focus on just where the center of a cyclone is expected to move. At this time, the southeast Vanuatu Islands are expected to see the most significant impacts, but there is potential for significant rainfall and strong winds for other areas as well. North Island, New Zealand is expecting some impacts by the end of the weekend, but the details are uncertain at this time. And for the Gold Coast? While a little more trade swell is expected through the end of the week as described in our official forecast for the Quik Pro, a major cyclone swell isn’t going to happen before Friday. Pretty much what Doc said. As far as cyclones go these are not especially powerful. Things to be aware of are damaging wind, flooding, and possibly storm surge and beach erosion if you are right on the coast. Your local weather service is the best source for information on these hazards for your area and how to prepare for them. You will definitely want to be prepared for power outages. Have enough food, water and illumination. I would suggest also securing loose items on your property. Beyond that, I don't think you need to worry too much. Edit: Sorry, didn't realize we were talking about Pam mostly. Not an imminent risk, but definitely one to keep an eye on. Not an imminent risk, but definitely one to keep an eye on. Yea, At least with Yasi it was pretty much a strait line from where it formed to where it crossed(about 180km south of us). This this I'm not so sure. I'm moslty aware of what to do, We plan to clean out and fill the wheelie bin and a few storage containers for water. We have a small car fridge, solar and car batteries for power and small butane burner for cooking. Not out first foray into cyclones and prob not our last but thank you all for your help.